The launch countdown has entered a planned T-4 minute hold. This hold will last 15 minutes. There are no weather constraints. There are no weather constraints for launch this morning. Launch is targeted for 7:05 a.m. EDT (4:05 a.m. PDT), at the beginning of a two-hour launch window. The rocket standing ready on the pad at Space Launch Complex-3 at Vandenberg Air Force Base in California, is a United Launch Alliance Atlas V 401 configuration. It is the workhorse of the Atlas V fleet, delivering about half of all Atlas V missions to date. The 401 designation means this rocket has a payload fairing, or nose cone, that is approximately four meters wide, a common core booster with no solid rocket boosters, and a Centaur upper stage with a single engine. Booster propulsion is provided by the RD-180 engine system, a single engine with two thrust chambers. The RD-180 burns Rocket Propellant-1 (RP-1), a highly purified kerosene, along with liquid oxygen, providing 860,200 pounds of thrust at liftoff. The booster is controlled by the Centaur second stage avionics system, which provides guidance, flight control and vehicle sequencing functions during the booster and Centaur phases of flight. The single-engine Centaur upper stage is a cryogenic vehicle, fueled with liquid hydrogen and liquid oxygen. The two-piece payload fairing that protects the Insight spacecraft tops the vehicle. The Atlas V 401 rocket stands 188 feet tall, or about as tall as a 19-story building. Fully stacked, with spacecraft, the rocket weighs about 730,000 pounds, or the equivalent of 14 big rigs fully loaded with cargo. NASA’s Interior Exploration using Seismic Investigations, Geodesy and Heat Transport (InSight) will be the first interplanetary mission to take off from the West Coast. 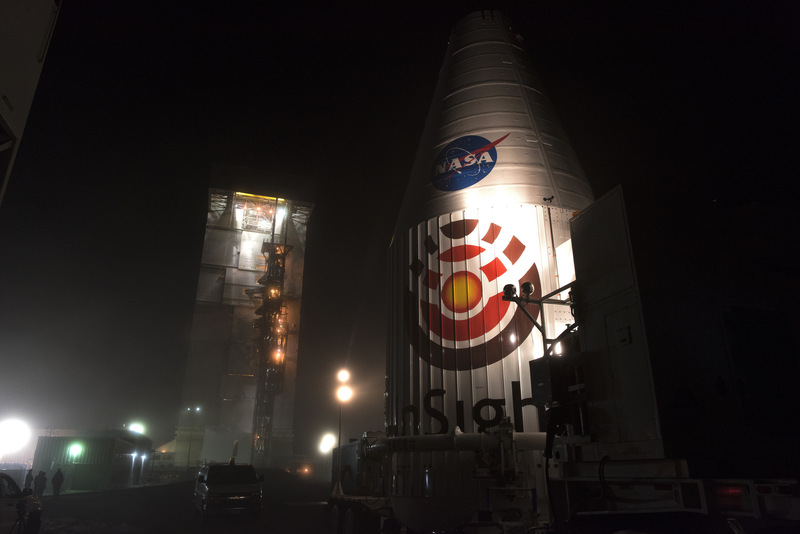 InSight is targeted to launch at 4:05 a.m. PDT (7:05 a.m. EDT) from Space Launch Complex-3 at Vandenberg Air Force Base in California aboard a United Launch Alliance Atlas V rocket. InSight is a NASA Discovery Program mission that will place a single geophysical lander on Mars to study its deep interior. The terrestrial planet explorer will open a window into the processes that shaped the rocky planets of the inner solar system (including Earth) more than 4.5 billion years ago. Using sophisticated geophysical instruments, InSight will address fundamental questions about the formation of Earth-like planets by detecting the fingerprints of those processes buried deep within the interior of Mars. The InSight lander is equipped with two science instruments that will conduct the first “check-up” of Mars, measuring its “pulse,” or internal activity, along with its temperature and “reflexes,” or the way the planet wobbles when it is pulled by the Sun and its moons. The science payload comprises two instruments: the Seismic Experiment for Interior Structure (SEIS), provided by the French Space Agency, with the participation of the Institut de Physique du Globe de Paris (IPGP), the Swiss Federal Institute of Technology, the Max Planck Institute for Solar System Research, Imperial College and the Jet Propulsion Laboratory. The second instrument, the Heat Flow and Physical Properties Package (HP3), is provided by the German Space Agency. Also, the Rotation and Interior Structure Experiment (RISE), led by JPL, will use the spacecraft communication system to provide precise measurements of planetary rotation. InSight’s lander will spend two years investigating the deep interior of Mars. For more information visit the InSight mission overview. Watch the InSight live launch coverage on NASA TV at: www.nasa.gov/nasalive. 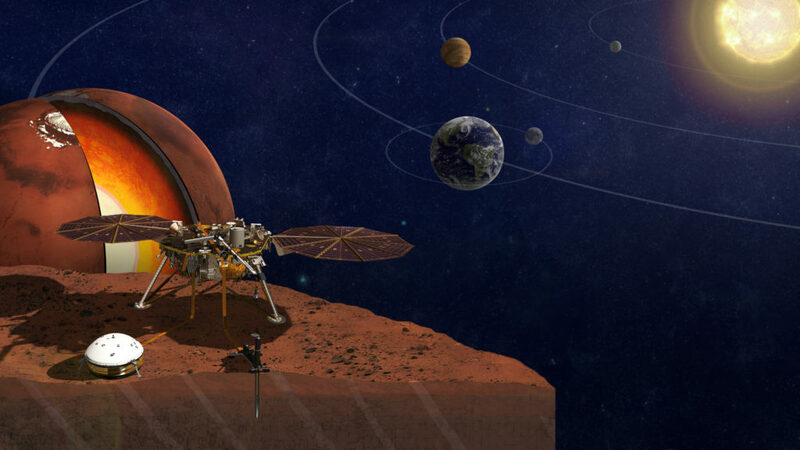 NASA’s next mission to Mars – the Interior Exploration using Seismic Investigations, Geodesy and Heat Transport spacecraft (InSight) – is scheduled to launch as early as Saturday, May 5, from Vandenberg Air Force Base in California. 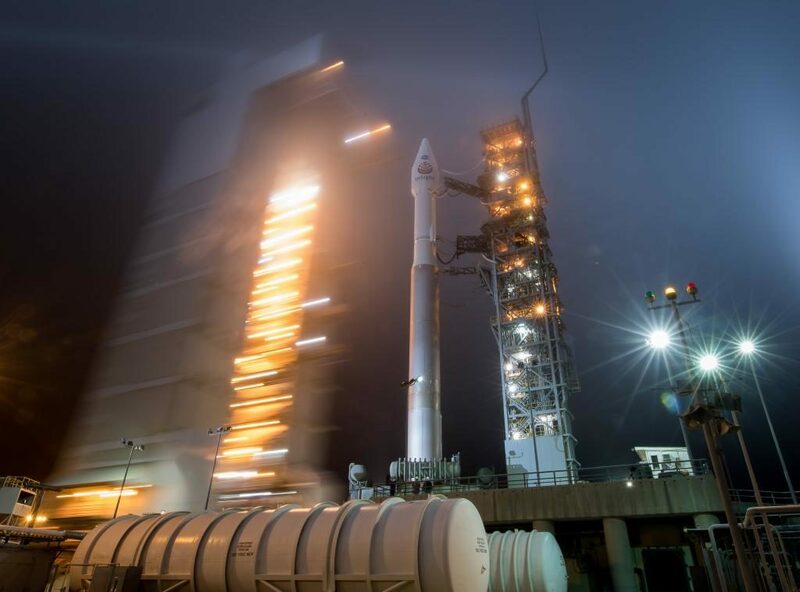 InSight’s liftoff aboard a United Launch Alliance Atlas V rocket from Space Launch Complex-3 is targeted for 7:05 a.m. EDT (4:05 a.m. PDT) at the opening of a two-hour launch window, making it also the first interplanetary mission to take off from the West Coast. This is the third mission in the robust schedule for NASA’s Launch Services Program this year, launching six missions in just six months, with six different rocket configurations, from six launch sites. With only two days remaining until the scheduled launch of NASA’s Interior Exploration using Seismic Investigations, Geodesy and Heat Transport (InSight) spacecraft, launch and mission managers will hold a prelaunch briefing today, May 3, at 4 p.m. EDT (1 p.m. PDT) at Vandenberg Air Force Base in California. Watch the InSight Prelaunch Briefing live on NASA TV at www.nasa.gov/nasalive. Meteorologists with the U.S. Air Force 30th Space Wing predict a 20 percent chance of favorable weather for liftoff of a United Launch Alliance Atlas V rocket carrying NASA’s InSight spacecraft. The overall probability of violation will be 80 percent with the Range Safety constraint of launch visibility being the only area of concern. Launch is scheduled for Saturday, May 5 at 7:05 a.m. EDT (4:05 a.m. PDT) from Space Launch Complex 3 at Vandenberg Air Force Base in Central California. Launch week is underway at Vandenberg Air Force Base in California, where NASA’s InSight spacecraft is being prepared for its upcoming flight to Mars. 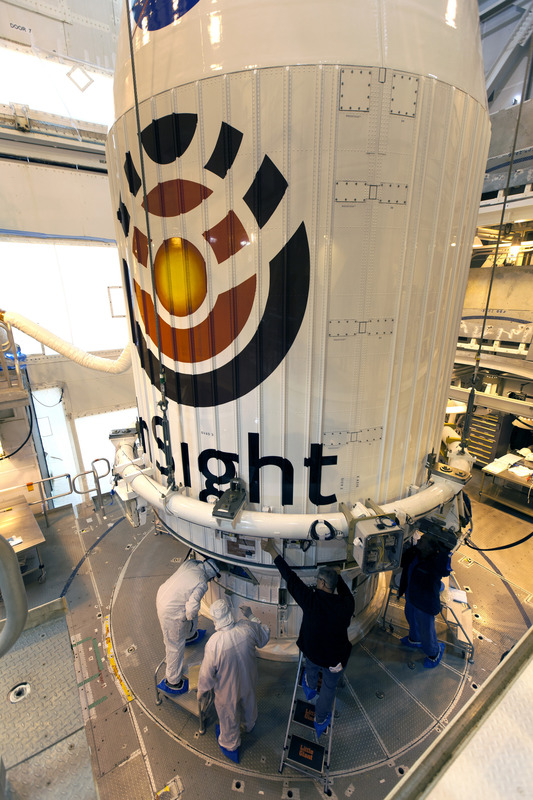 Mission and launch officials gathered Monday for the InSight flight readiness review. Teams are preparing to launch InSight on its United Launch Alliance Atlas V rocket Saturday, May 5, at 4:05 a.m. PDT (7:05 a.m. EDT). Prelaunch activities continue today as launch team members take part in a countdown dress rehearsal. InSight will be the first mission to look deep beneath the Martian surface. It will study the planet’s interior by measuring its heat output and listening for marsquakes. InSight will use the seismic waves generated by marsquakes to develop a map of the Red Planet’s deep interior. The resulting insight into Mars’ formation will provide a better understanding of how other rocky planets, including Earth, were created. NASA’s Jet Propulsion Laboratory in Pasadena, California, manages the InSight mission for the agency’s Science Mission Directorate. InSight is part of NASA’s Discovery Program, managed by its Marshall Space Flight Center in Huntsville, Alabama. The spacecraft, including cruise stage and lander, was built and tested by Lockheed Martin Space in Denver. Several European partners, including France’s space agency, the Centre National d’Étude Spatiales, and the German Aerospace Center, are supporting the mission. United Launch Alliance of Centennial, Colorado, is providing the Atlas V launch service. NASA’s Launch Services Program, based at its Kennedy Space Center in Florida, is responsible for launch management. NASA’s next Mars lander is one significant step closer to beginning its journey. 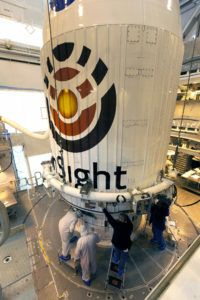 Secured inside its payload fairing, the agency’s Interior Exploration using Seismic Investigations, Geodesy and Heat Transport (InSight) spacecraft was transported from the Astrotech facility to Space Launch Complex 3 at Vandenberg Air Force Base in California. The payload fairing was hoisted up inside the Vertical Integration Facility and attached to the United Launch Alliance Atlas V rocket. Liftoff is scheduled for May 5, 2018.